Walters State's Counseling and Testing Center is a place where students can find encouragement and support. The center is staffed by professionally trained counselors who provide services for a wide range of educational, vocational and personal issues. Services available include career counseling, services for adult students, personal and academic counseling. Testing services include ACT testing, placement testing, College Level Examination (CLEP), Praxis, Pearson Vue, other testing services. Also, the center offers the community an opportunity to take the Tennessee High School Equivalency Test (HiSet). Contact the center at 423.585.6804 for additional information. For all other testing information, please call 423.585.6802. Counseling and Testing also offers counseling, support, and resources for those needing additional help with issues centered around drugs, alcohol, or sexual assualt. The staff members of the Counseling and Testing Center are dedicated to providing services that support the academic and career pursuits of Walters State's student body. Toward this end, the following services are provided: standardized assessments, including the ACT, HiSet, MAAP, etc. 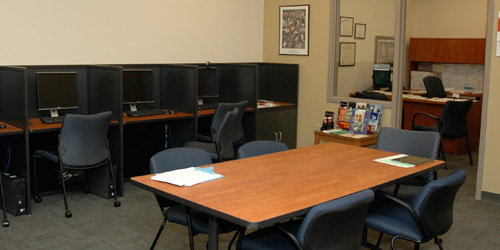 ; academic counseling, including activities focused on selecting a major course of study, study skills development, dealing with test anxiety; personal counseling for issues that might pose barriers to success; career counseling, including activities focused on the assessment of aptitudes and abilities, career decision-making skills, job research, and placement outlook/services; and crises intervention as needs arise.